Patrick Smith, airline pilot and author of the recently released book Cockpit Confidential , sat down with Dr. Todd Curtis of AirSafe.com to discuss his latest work, and to share his thoughts on other issues facing the airline industry. After an ANA and JAL 787 aircraft experienced battery fires in January 2013, the entire fleet of 49 aircraft was grounded while the problem was diagnosed and an acceptable plan for fixing returning the aircraft to service was developed. While Boeing did come up with a repair plan that was acceptable to the FAA, it appears that the JAL 787 that experienced a battery fire in Boston had to also go through a very extensive set of repairs before it could return to service. As described in an earlier article, Boeing and the battery manufacturer have made a number of FAA-required changes to the 787, including the installation of a redesigned battery, that the FAA estimated would take about 113 work hours to complete. Several media outlets, including the BBC and New York Times, reported that during an interview in late April 2013, Larry Loftis, vice president and general manager of the 787 program, stated that the Boeing modification kit would take about five days to install. Given the estimate of 113 work-hours from the FAA, that implies that a small team of maintenance personnel could put the aircraft back in service within that time frame. However, for the JAL aircraft that caught fire in Boston, that has clearly not been the case. The aircraft has been grounded in Boston since its APU battery caught fire on January 7th, and was still on the ground at least until May 12th, over two weeks after the first updated 787 returned to service. The aircraft was parked outside near one of the airport terminals, and could be easily seen from several public vantage points. As you can see the photo below, there was a large tent erected next to the 787, presumably associated with the aircraft repair. According to one eyewitness, a second, similarly sized tent, had been recently removed, and had be in place for a number of days. Although the NTSB has an ongoing major investigation associated with the 787 battery fire event, no final report has been published, and the information currently on the NTSB site does not mention any significant damage to the aircraft beyond the structures and systems close the battery that caught fire. Neither Boeing, JAL, or Massport, the organization the manages Boston's Logan Airport, have released any statement to the public about any significant additional aircraft damage. If you have direct knowledge of what may have been going on with the JAL 787 in Boston, specifically details about any repairs that may have been performed on this grounded 787, please feel free to contact AirSafe.com at feedback.airsafe.com. 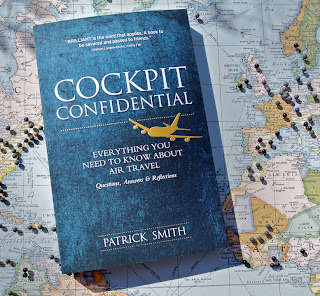 Cockpit Confidential , the latest book from Patrick Smith, is very much an insider's guide to the airline business in general and the life of an airline pilot in particular. This book is about the airline business and about airline careers, but perhaps more importantly it is a story about a love affair. Not the kind that is short, passionate, and comes to a dramatic end at the first sign of trouble, but a love that runs deep, the kind that evolves and matures over decades, and that is strong enough to survive more than a few trials and tribulations. Patrick shares his lifelong love affair in ways that can be appreciated by current and aspiring aviation professionals, as well as by the average passenger. He addresses a variety of questions about aviation, including questions about how airplanes work, how pilots work their way up the ranks, and why airlines behave in they way they do toward customers and employees. Will it answer every question a passenger or future pilot would have? Certainly not. However, for anyone who has a deep interest in the world of airlines, this book is a real treat. Do you have questions about how airliners can fly? You'll have some of your basic questions answered. want to know about the funny noises your plane makes? Patrick can give you a heads up. How about all those questions you have about the mysterious and glamourous life of an airline pilot. Surprisingly, Patrick does have tales of pleasant five star luxury suites, but also not so romantic stories of cooking ramen in the hotel coffee pot. Are you ticked off about the state of airlines today? So is Patrick. Any reader who has spent a significant amount of time in an airplane, either in the cockpit or the cabin, will certainly recognize some of the situations that Patrick has seen or experienced. Want to be an airline pilot? If so, definitely read this book. Patrick's career as a professional pilot has spanned several decades, several airlines, several setbacks, and several radical changes in the airline business. His descriptions of the high and low points of his career, as well as the positive and negative aspects of the typical airline pilot's career, aren't sugar-coated at all, and in my opinion should be required reading for anyone considering a flying career. As Patrick explains, becoming a pilot takes years of sacrifice and determination, and different challenges will have to be overcome once a pilot puts on that uniform for the first time. This week, Todd Curtis of AirSafe.com will interview Patrick Smith about his book and about the airline business. Do you have a question for Patrick? If so, send your question to feedback.airsafe.com.